The high performance luminaire is designed for applications where long life, low maintenance, and consistent color rendering is required. Various beam spreads allow for a customized finish to any property. The high end system was designed for 120V operation. The fixture can be ground, wall, or pole mounted making it versatile enough for commercial, industrial, or residential lighting applications. The heavy duty housing is constructed of cast aluminum. The optical assemblies are sealed in place using a silicone gasket for weather tight protection. The housing acts as a heat sink with heat dissipating fins to maintain a cool operating LED for maximum life. The fins are independently supported to allow for unobstructed airflow. The fixture is designed to efficiently perform in any mounting orientation. Made with a state of the art UV stabilized acrylic high performance refractive optical assemblies that use high transmicity materials to achieve precise photometric distributions. Available in a facade light beam configurations. NOTE: A TECHLIGHT SURGE PROTECTOR MUST BE INCORPORATED INTO THE LED SYSTEM AT THE BEGINNING OF EACH CIRCUIT AS A MINIMUM. FAILURE TO DO SO WILL VOID THE SYSTEM WARRANTY. Fixture operates at 120V input voltage. Nominal open circuit current . amps. 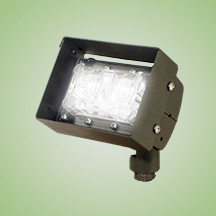 An 11 watt LED source provides approximately 770 Lumens of light. System is compatible with the use of an approved trailing-edge dimmer. Standard mounting option available is a ½” threaded knuckle mount. Additional mounting options may be available for custom applications. Meets US and Canadian safety standards. -40°C to 50°C ambient operation. RoHS Compliant.